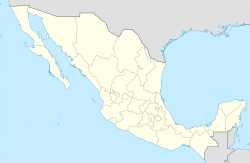 Acapulco is a town and sea port on the Pacific coast of Mexico, 300 km (190 miles) southwest from Mexico City. Acapulco is on a deep, semi-circular bay. It is a stop for shipping and cruising lines running between Panama, and San Francisco, California, USA. In 2005, about 722,499 people lived there. Its name is a Nahuatl word, meaning "plain of dense reeds". The city has been a port since the 16th century. This page was last changed on 7 April 2018, at 07:51.